Whether you prefer relaxation or adventure, sometimes the journey itself can be our favourite part of a trip abroad. So why not make the most of your time and hop on board a locomotive? Railway journeys have always offered wonderful opportunities to take in the world’s most dramatic scenery. Depending on whether you prefer a heart-racing ascent up a steep mountain, or a languorous and romantic roll through a winding valley – here are some railway routes to excite you. The Devil’s Nose Railway in Ecuador (‘El Nariz del Diablo’) is one of the truly marvellous railway engineering achievements of the late 19th and early 20th centuries. The train pulls through stunning Andean scenery, passing waterfalls, rivers and ravines (and some vertigo-inducing drops). But the really defining feature here is the spectacular ride up and down a nearly vertical wall of rock, an obstacle which lead the line to be dubbed ‘the most the difficult railway in the world’. The ingenious engineering solution found, was to carve a series of tight zigzags out of the rock, allowing the train to climb 800m by moving forwards and then backwards along the tracks. 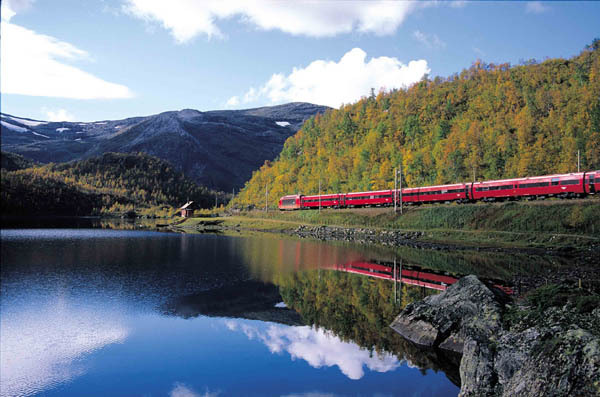 In Norway the sleek Bergen line takes seven hours to travel from Oslo to Bergen, zooming through some of Scandinavia’s most imposing landscapes and Europe’s largest mountain plateau, ‘Hardangervidda’. Considered by many international rail enthusiasts to be the most exciting and beautiful train ride in the world, the Bergen Railway was completed in 1909. The line flows through deep canyons, snowy precipices and glacial fjords and is still the highest altitude train ride between two cities in Europe. In comparison, Japan’s brand new super luxury train, Nanatsuboshi or ‘Seven Stars’ also focuses heavily on the beauty within, as well as the scenery outside. Combining the golden age of travel with modern day comforts, the train is immaculately fitted out, even featuring a piano in the bar. Departing from the port of Fukuoka, the train takes four days to tour around the western Japanese island of Kyushu including a stop-off at Mt. Aso (Japan’s largest active volcano). This deliberately isn’t a rushed affair - the emphasis is on taking time to absorb the history and culture of Kyushu whilst enjoying a luxurious stay on board.